For the first 30 minutes of the hike from Jagdol, Kapan to Tarebhir Village, a Tamang village in the foothills of Shivapuri Nagarjun National Park, the trail was all uphill. The view around me was obscured by the trunks of pine trees and the view above by swaying pine needles. I could still see the motorable road that I had left behind. and the higher I climbed, the fainter the sounds of civilisation got. Soon, the only sounds I could hear were the rustle of pine needles, the soft crunch of dead leaves and prayer flags—hundreds of them—fluttering in the wind. A little over 30 minutes ago, I was in Boudha, navigating the traffic, engulfed by dust and a cacophony of motor vehicles. The day before, Tashi, a dear friend and avid hiker who had hiked to Tarebhir more than a dozen times, insisted that I join him and his colleagues on a hike to Tarebhir Village. He had told me that the trail is little-known, and very confidently, that I would not regret it. I wasn’t sure. But within 30 minutes of the hike, all my doubts were laid to rest, and I had already thanked him several times for insisting that I come with him. I was in love with the remoteness, the serenity, and the plentiful natural beauty the trail offered. For more than an hour into the hike, we would only see two other people. Around 40 minutes into the hike, we reached the top of a hill and the trail flattened. There were now fewer pine trees, which meant the views around us were finally visible. 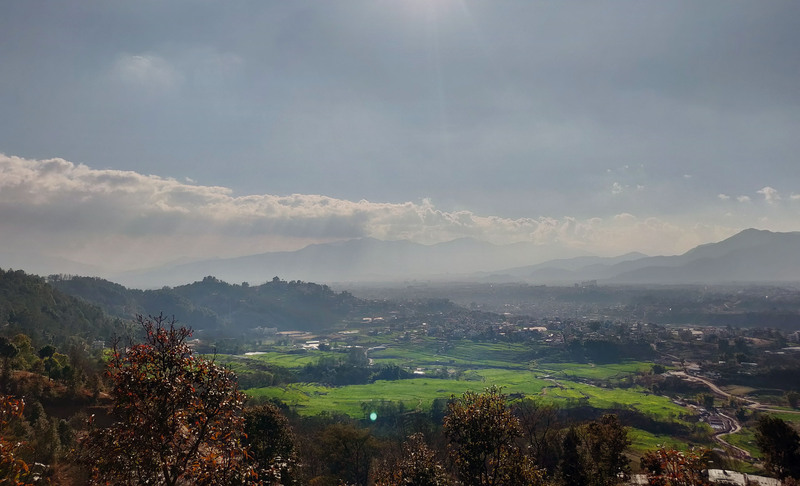 To our left, was the northern and north-western side of Kathmandu—with its ever decreasing farmlands and ever increasing number of houses, which on that warm sunny day looked like colourful bricks baking under the warm winter sun. And without trees blocking the view, we finally got to see the deep blue sky pockmarked with puffy white clouds. An hour into the hike, the trail changed, rather dramatically. We were no longer walking on a jungle trail; we were now on a motorable off-road—the kind that is now increasingly common in hill villages all over the country. This road connects Tarebhir Village to Budhanilkantha. But during the monsoon, a villager told us that the road gets very muddy and some sections even develop holes, making it extremely challenging for motorists to navigate. But for hikers, the road is great year round. Some 20 minutes on the off-road, we reached the southeast edge of Tarebhir Village. That was where we left the road and took a narrow uphill trail that led us to the entrance of the village. At the entrance was a small white Buddhist chorten. And it wasn’t simple, but quite elaborate. It had prayer wheels, a statue of a deity, and even seven palm-sized steel bowls filled with water and flowers, a traditional offerings in Buddhist altars. I had seen such elaborate chortens in Buddhist villages in the mountainous regions of the country, but it was my first time seeing one in villages near the valley. There was a second surprise. As we neared the centre of the village, I saw an imposingly tall cliff rising at the northern edge of the village. The name of the cliff, I was told by a villager, is Tarebhir and that’s how the village got its name. As we entered the belly of the village, we started seeing boulders, big and small, strewn all over the village. And in true Nepali fashion, most of the boulders had clothes drying on them. But what was strikingly similar to other villages was the number of new houses, many still under construction. Like many villages around the Valley, the 2015 earthquakes, too, did extensive damage to houses in Tarebhir, and many were finally being rebuilt. Then out of nowhere, it started getting windy, and tall bamboo trees, which were plenty in the village, started making a loud creaking noise. About 10 minutes from the entrance, we reached Bikash dai’s house. His wife, said Tashi, makes the best dal bhat in the village and that no trip to Tarebhir is complete without stopping at his house for lunch. So there we were, sitting on a hay mat on Bikash dai’s front porch, a bit tired and very hungry, waiting for food. And when the food came, all of us had big smiles on our faces. 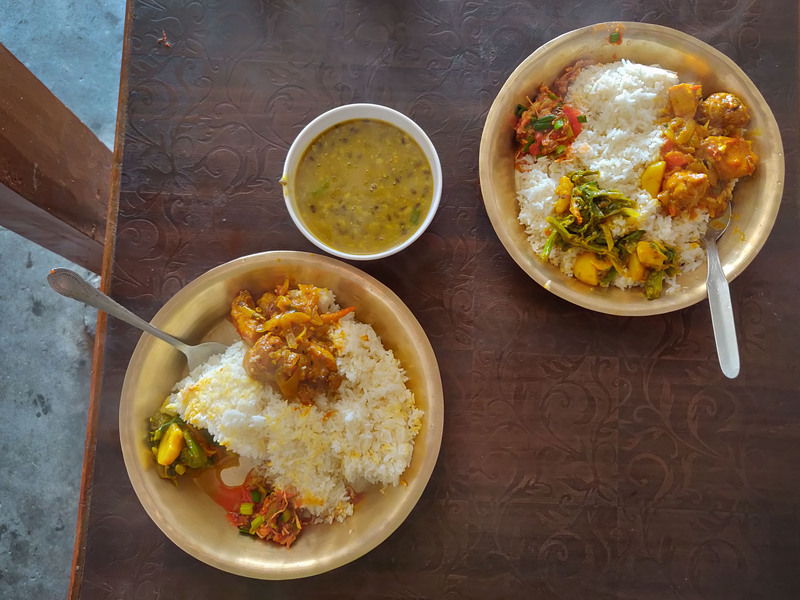 The food was served on brass plates and had rice, lentils, chicken curry, potato and spinach curry, and freshly-made cucumber and green chilli chutney. The lentils were delightfully thick and the masala-rich chicken curry went great with the rice. The vegetable curry was minimally seasoned and the chutney’s crunchy cucumber and chopped green chilli topped with lemon added some zest. It didn’t take us long to ask for a second helping. As soon as we had eaten, a villager in his 50s came ambling to Bikash dai’s and ordered a bowl of chyang. He drank it in one go and ordered another, which he drank in another go. Now, I had never had good luck with the chyang I had in villages. All of them had either been too bitter, too sweet and almost every time, very watery. But it had been a good day with a great hike and a great meal, and I wanted to push how far my luck would take me. I ordered a bowl of chyang, and it wasn’t like anything I had ever had before. It was thick with just the right amount of sweetness; it was aromatic and very, very strong. I felt thankful for having discovered a great trail, perhaps the best place to have dal bhat and some seriously potent chyang. I felt lucky. I lied down on the mat. Maybe it was the hike, or maybe it was the chyang, I started feeling sleepy. I lied down on the hay mat and drifted off to sleep.